Many people claim to have an aversion to orange. Do they think they are being tasteful? I love it in the garden, especially in pots. It’s especially useful in a spring like the one we’re having, in freezing winds and with sploshy grey clouds above we need some warmth and brightness; it cheers me up, makes me feel a little more lively. I can taste Opal Fruits when I see clear orange tulips (and I refuse to call those little filling snatchers “Starburst”). 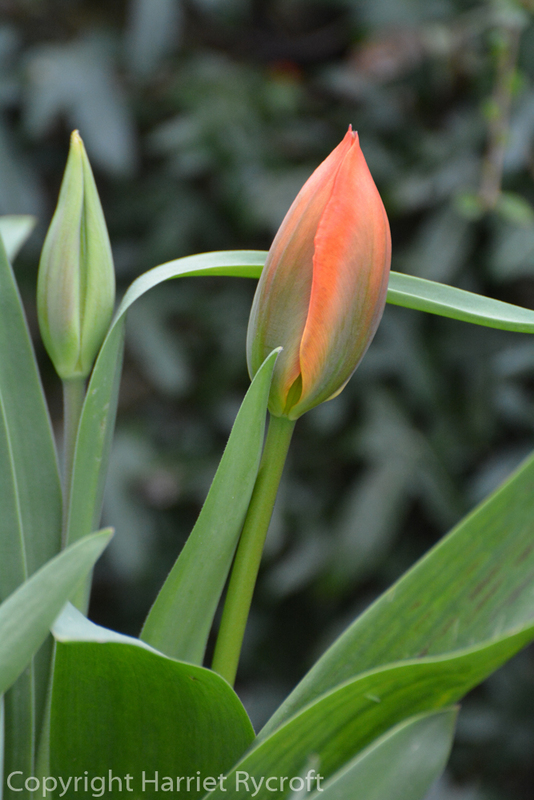 I planted Tulipa ‘Orange Emperor’ for the first time this year. The flowers are still young, and will develop more yellow at the base. I like their glossiness and the green ray on the outside of the tepals. They are said to be darker inside and slightly fragrant but have remained clamped shut so far. I don’t blame them. Four days later the Emperor is getting richer and his bottom is slightly yellow. 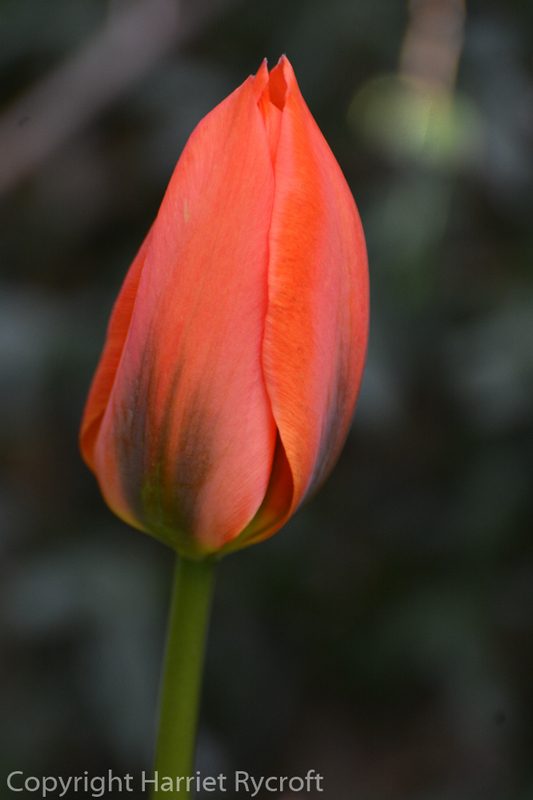 It’s a Fosteriana tulip, so is one of the earlier tulips to flower, I thought I had planned a series of tulipy flowering events rather cleverly but of course you can’t be sure how things will turn out. 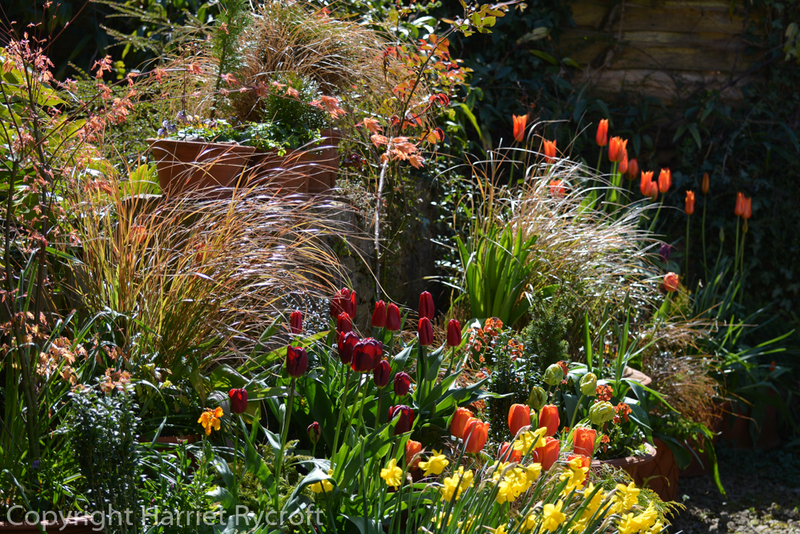 Unfortunately their pot is between two which contain another orange tulip, ‘Ballerina’. These pots were never dismantled from last year, and as you can see, ‘Ballerina’ repeat flowers really well but of course the established tulips flower very slightly earlier than newly planted ones (I’d forgotten about that), and so they are all flowering at the same time, when I had hoped one would follow the other. Oh well. Despite the tulips not taking much notice of my detailed plans I’m very pleased with them all and have told them so. It seems the Emperor and the Ballerina have a surprising amount in common, and they are performing well at the far end of my “car park pots”. Car Park Pots today. Orange Emperor is at the back, flanked by Ballerinas. Hi Jo, thanks, that group catches the afternoon light rather beautifully so I already have many photos of it… Yes it is Anemanthele lessoniana – this grass seeds itself around in my garden a little, so I hoick out the odd clump and bung it in pots, great for a bit of winter/spring height and movement, and absolutely free!